The Nuremberg Chronicle, Liber chronicarum, was authored by Hartmann Schedel (1440–1514) in 1493 CE and presents a world history that celebrates the city of Nuremberg as a spiritual and geographical hub comparable to the true Christian Jerusalem. By making this connection the book's author and its artists promoted their city as equally if not more important than the holy city, asserting Nuremberg’s centrality in the German Empire as well as the wider world. Unsurprisingly, the Chronicle contains more than one image of Jerusalem. In the illustration here, the artist Michael Wolgemut (1434–1519) imagines the cityscape as he thought it appeared while the first Temple stood. 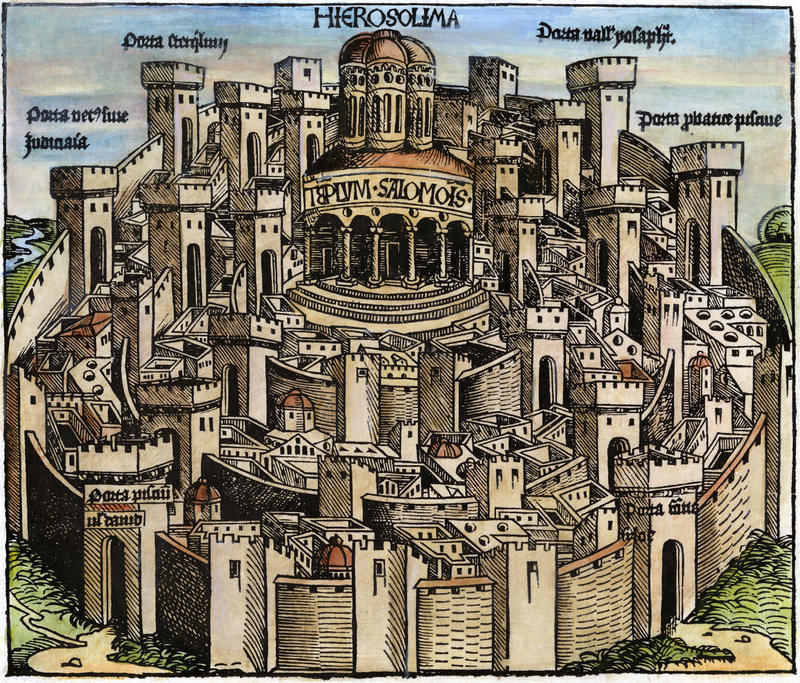 Jerusalem is pictured as a circular walled city, with Solomon’s Temple, Templum Salomonis, at its centre. The grand building is topped by three small domes, giving it the appearance of a Byzantine church rather than an antique temple. The destruction of the Temple by Titus is imagined in the same volume. In that image, the Temple blazes; it no longer looks like a church, but echoes the design of the Dome of the Rock, with a large bulbous dome carrying a crescent moon. The artist thus conflates the siege of Jerusalem by Titus, which many Christians hailed as the fulfilment of Christ’s prophecy that the Temple would be destroyed (Luke 21:6), with a contemporary Christian desire to bring an end to Islamic rule over Jerusalem. There aren't any related items yet. Why not view everything in Imaginations: The Temple?